A Public Space has long (well, since 2005, but that's longer than I've been in New York) been one of my favorite journals to find excellent writing that's unexpected but not gimmicky (usually), like their clever "If You See Something, Say Something" series. Tonight, they're coming to the lovely and local (to me) Fort Greene Park to do a writing with three of their writers. I never miss an opportunity to promote events in my hood. 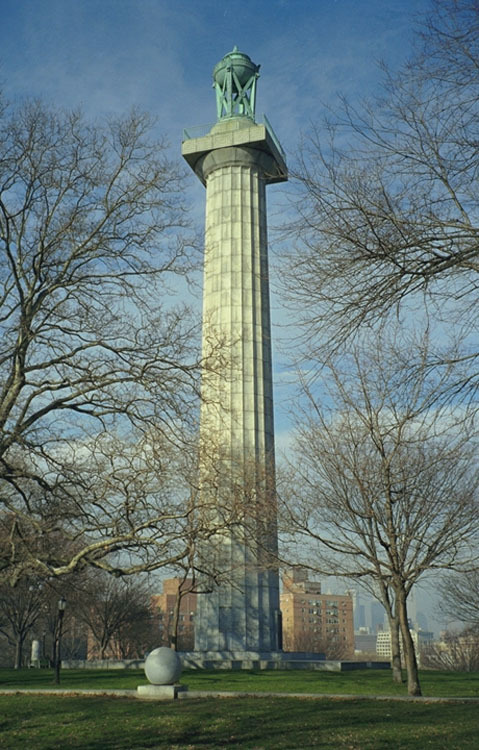 Also of note, is that the Prison Ship Martyrs Monument, the impressive obalisque you see above, has at some point this year been restored to its former majesty, instead of being inaccessible behind orange plastic fences and covered in ugly scaffolding, as it was ever since I've been living near Fort Greene. The monument, and the impressive stone steps leading up to it, as I discovered several weeks ago during a David's stay, are worthy of a D.C.-caliber walkdown. Michael Schwartz is a poet, playwright, and Coney Island resident. He is an awardee of the Interpreting Brooklyn Project, founded by the Brooklyn Historical Society. Elizabeth Gaffney is a writer and editor at large for A Public Space. Her first novel, Metropolis, was a Barnes and Noble Discover Great New Writers selection. She is now at work on a second novel and a story collection. L.J. Davis is a prize-winning journalist and author of A Meaningful Life. A former Guggenheim Fellow and the winner of a National Magazine Award, he lives in Brooklyn. It all gets started tonight at 6:30 at the Fort Greene Park Visitor Center.